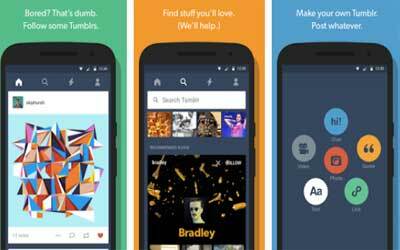 Tumblr APK 6.6.0.03 is one of prominent blogging application and social media networking site. This site is launched in 2007 to accommodate people who want to post many things. Basic feature of Tumblr APK is blogging like a personal site for users. They can add personal information such as name, data of birth, city of living, job, etc. As social media, this application can connect user to others then share posting. Besides simple text on dashboard, users can place their schedule to show their activity. If you do not like share to public, private option is available so another user has to send request before following. All of function of this micro blogging can be accessed on dashboard. There is live event which user post what he or she is doing now at exact moment. You can upload image or photo then share through other social media to gain more visitors. Comment feature is optional, so user can decide whether visitor or follower that is allowed to write comment. Another feature is queuing on post to put hold for moment before officially on dashboard. This feature is very useful if user has certain issue with posting to prevent unwanted respond. The time for queuing is varying depends on user setting from hours to some days later. Searching certain post on the million contents is very exhausted. Tumblr give tags feature to let user searches specific content accurately. When posting something, you write words as tags then others will follow if the tags are their interest. This tagging is not for text or picture but also video. Actually, user is still able to share without uploading. You just put link on video or picture on Tumblr then click share button. As blogging, this service is different from other social media because Tumblr is like personal website. Furthermore, Tumblr for Android is one option to spread your thought to the world. GIFs, text, videos, audio, anything. Your passions can take any form on Tumblr. Art, music, comedy, design, philosophy, politics, random stuff, science, random stuff again, sports, hey, whatever. If it’s interesting, it’s on Tumblr. Plenty of ways to find the good stuff. Search for it, or just check out what’s popular/interesting/weird/wonderful. Post whatever you want to your own Tumblr. Or just reblog other people’s stuff. Add commentary if you like. Make it your own. Other people will do the same to your posts. That’s how you meet people here. You can also just send private messages to the people you follow, if that’s more your thing. Tumblr is yours. Make your Tumblr look however you want. Season 6.5 of Tumblr is now available to binge. Catch up on all your favorite features. Remember: If you haven’t used it, it’s new to you! A brand new post type—the gif—shows up with its snazzy new GIF maker. Uh oh! Kanvas, YouNow, YouTube, and Upclose move in with Tumblr. Hilarity ensues. Conversations get a camera button and start making moves.